Infectious diseases were the epicenter of the last millennium , metabolic issues are said to be dominant of the present era. First recipient of insulin was a 14 year old boy from Canada, 11th Jan 1922. Isolated in crystalline form by Abel in 1930. 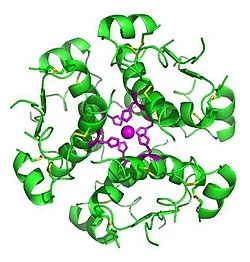 Human Insulin is produced by recombinant DNA technology, structural alterations at one or more amino acid residues modify its physical and pharmacological characteristics. It is coded for on chromosome 11 and synthesized in the beta cells of the pancreatic islets. There are two chains, that is chain A which contains 21 amino acid molecule and chain B which contains 30 amino acid molecules linked by disulphide bridges. It is coded on chromosome 11 and synthesized in the beta cells of the pancreatic islets. C. Source – which is previously mentioned, based on from where insulin is extracted. Decreases lipolysis, and increases amino acid transport into the cell. Protein synthesis is increased and breakdown is decreased. Hypoglycemia- Unmonitored dosing and carelessness can cause insulin shock and bring down the glucose levels to lethal levels. Lipohypertrophy- overuse of a single injection site due to lipogenic property of insulin, can occur with any type insulin.